How does your product compare? Can we all agree that this question is a doozy? It’s admittedly a challenge to answer this question – The most suspect response is when a company representative’s first reaction to this question is to strike out at the competition instead of explaining the benefits of their own product/service. Absolutely, there are some wonderful reasons to select our product. I can, no doubt, list the many reasons of which I’m aware. I can also guess that our competitors have a similar list. Is one list true and the other false? Is it all spin? Who is correct? How can consumers or potential customers know where to go for an unbiased comparison? In short, how do you choose between different brands, companies, and products? More importantly, how do you answer this question in a fair and helpful manner? When I worked for Franklin and Marshall College in a previous life (a good 10 years ago), I found this question to be problematic because it was impossible to directly compare one college to another, particularly since it was unlikely that many people had attended more than one college to make a full, fair comparison. I certainly had not attended either college being compared, and was earning my living representing only one. In addition, while courses, facilities, opportunities, costs, extracurricular activities, etc., are important differentiators for the prospective student, in the end I always believed it should come it down to which school was the best fit for each person. Which school gave them the best feeling of belonging and felt the most natural to them? While it may seem a stretch, the tenants of the college selection process hold true in the software selection process as well – particularly kiosk system software. While college can cost upwards of $250,000 over four years, a large kiosk deployment can yield costs of six or seven figures. A true relationship is forged, and knowing the organization with which you are dealing can directly influence the success or failure of a project. In short, knowing and trusting the organization with which you engage should be a key factor in your selection process. To compare different kiosk system software solutions for instance, you’ll want to take the following steps. Make a list of the necessary features to your project. Attract screen? Check. Start Page? Check. Session time out? Check. Windows OS? Check. Dual Monitor? Check. External Device Support? Check. Compare those features across each of the products you are considering. Most companies will have a feature comparison chart (like ours, here). If all of the features are obviously available, “great”, if not, call to see if features are available but not properly promoted or described using slightly dissimilar phrasing. There are so many features and options, and so little marketing space in which to convey them. Download free trials of the kiosk software you are considering and compare your own experience to see if the features your project requires are configurable. Check pricing. Once you have determined features, you’ll know which product level offers the features you need – and you can price those products. Upgrades, future proofing for “someday” integration. Many of the products you are considering likely have interesting features that may be useful in the future. In the case of KioWare, for instance, you may be planning to utilize KioCall video conferencing in a future project expansion, but it could also be a “maybe someday” option that is not necessary at the time of initial project deployment. You will want to include these “maybe someday” options as a factor in your decision-making process. Future proof your project to make sure it continues to be a relevant investment for your organization. Before you purchase, you will want to see how difficult it is to obtain support should you need technical assistance in the future. Chat with a customer service representative, email support, call the office (717-843-4790). See if you can get answers to your questions, and determine if you are satisfied with the speed of the response, and the answer you receive. Find a company with which you can confidently partner – who will help you out should the unexpected occur in a project. Some of the comparisons and questions we hear are from prospective customers considering KioWare and one of the software companies below. All of these companies have a number of great clients/customers. It is up to you to find the company and software that fits the best with your kiosk project (Oooh Oooh, Pick us, Pick us!). That’s us! Obviously we have the BEST kiosk software, the MOST features, the SMARTEST developers, and the NICEST sales & support team. And we are NOT AT ALL biased. The ability to download our software for free to try it out, and the fact that you may get KioWare President, Jim Kruper on chat or the phone for customer support gives an indication as to how important our customer is to us. We often find that users come across both KioWare for Windows kiosk software and Sitekiosk in their research process. There are probably a lot of great reasons to use Sitekiosk. We think there are even more great reasons to use KioWare. Fortunately, you can view the feature lists and try free downloads of both products before purchasing. Both have Chrome options (and IE). Both have been around for a long time. In the world of Android tablet lockdown, KioWare and Surelock are sometimes compared for providing Android kiosk software security and MDM. Both are available as Android kiosk apps in the Google Playstore and both have significant quantity discounts. Android lockdown software and kiosk apps for Android have significant overlap with MDM (Mobile Device Management). Surelock also has a separate MDM software that isn’t kiosk software whereas KioWare offers Kiosk Management and MDM via KioWare Server/KioCloud – but only by locking down the OS into a secure, lockdown environment. This one hurts as it is Linux based and open source. It seems to come up a lot in tech community forums as a viable non-Windows option. Apples and oranges can coexist quite well and this is a situation in which apples (Porteus) and oranges (KioWare) are both fruits (Kiosk software) but therein is the only commonality. Those in an educational technology role are often looking for browser lockdown software for testing purposes. Respondus is the most popular and widely used by educational institutions and serves to secure devices used for testing. KioWare performs similar functions and tasks, but is intended for broader use, and with more options for customization, external devices, and management. Used in many educational and institutional deployments, KioWare offers flexibility, customization, and management for a variety of institutional or educational uses. Additionally, KioCall video conferencing adds functionality that may appeal in an educational setting but is not available through traditional educational lockdown solutions like Respondus. Windows Kiosk Mode and Chrome Kiosk Mode serve as free methods of securing a browser to only specified websites and/or actions. Kiosk mode options are great for certain uses, but tend to miss the mark for more robust security, public access lockdown, and robust kiosk deployments which incorporate card readers, payment processing, cash dispensing, specialized printing, and more. Kiosk mode is only meant to secure the browser, not restrict access to file systems, clear user data, and resetting to a start page due to inactivity or completion of a task. Kiosk mode can be a great solution for some situations, but it isn’t a self-service kiosk solution and it isn’t meant for protecting users from unauthorized access to data and/or malicious use. If you are looking to secure an iOS device, you can do so with kiosk software for iOS such as Kiosk Pro. Kiosk Pro and other solutions for iOS differ from KioWare (and others mentioned above) primarily in that they secure Apple devices and cannot be used on Windows and Android. Kiosk Pro, in fact, uses Kiosk Management via KioCloud (provided by KioWare) – so you can run KioCloud to manage your Kiosk Pro iOS kiosk app and the corresponding iOS tablet kiosks. It’s quite common for us to get questions about kiosks running custom software developed for a large scale or prominent deployment. While KioWare can be found on kiosks run in retails stores like John Lewis, Best Buy, and TMobile, it is also found in health facilities like the Mayo Clinic, museums like the Smithsonian, and banks like TD Bank. Still, there are many prominent kiosks not running KioWare – JCPenney Associate Kiosks and popular photo kiosks seem to be the most commonly known. While selecting kiosk system software can be daunting, features and fit are the best ways to start making your choice and narrowing the field. 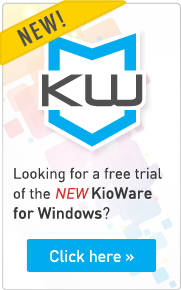 Try a free download of KioWare for Windows or KioWare for Android to see if KioWare fits your needs – then give us a call or chat with us. While there are a number of kiosk software options out there, we want you to be confident with your choice – and successful in your kiosk project.